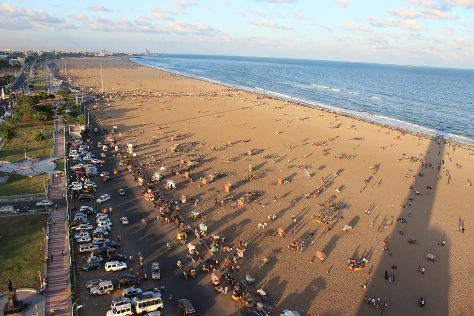 On the 20th (Mon), contemplate in the serene atmosphere at Kapaleeshwarar Temple, then kick back and relax at Besant Nagar Beach, and then kick back and relax at Marina Beach. To find maps, traveler tips, where to stay, and tourist information, you can read our Chennai visit website . The Route module shows you all the different ways you can get to Chennai. May in Chennai sees daily highs of 43°C and lows of 32°C at night. Cap off your sightseeing on the 20th (Mon) early enough to travel to Thiruvananthapuram (Trivandrum). Start off your visit on the 21st (Tue): see the interesting displays at Napier Museum, see the interesting displays at Puthenmalika (Kuthiramalika) Palace, admire the landmark architecture of Sree Padmanabhaswamy Temple, then contemplate in the serene atmosphere at Sreekandeswaram Mahadeva Temple, and finally tour the pleasant surroundings at Shanghumukham Beach. To see more things to do, other places to visit, reviews, and tourist information, read our Thiruvananthapuram (Trivandrum) trip itinerary builder tool . Traveling by flight from Chennai to Thiruvananthapuram (Trivandrum) takes 3 hours. Alternatively, you can drive; or take a bus. Traveling from Chennai in May, you will find days in Thiruvananthapuram (Trivandrum) are little chillier (37°C), and nights are about the same (30°C). Cap off your sightseeing on the 21st (Tue) early enough to go by car to Thekkady. Kick off your visit on the 22nd (Wed): identify plant and animal life at Elephant Junction and then look for all kinds of wild species at Periyar Tiger Reserve. Here are some ideas for day two: see the interesting displays at Angadipetty -Kerala Ayurveda Museum, then look for all kinds of wild species at Green Park Ayurvedic & Spices Plantation, then identify plant and animal life at Periyar Wildlife Sanctuary, and finally steep yourself in history at Shiny Tours & Travals. To find where to stay, maps, photos, and other tourist information, read Thekkady driving holiday planning site . Getting from Thiruvananthapuram (Trivandrum) to Thekkady by car takes about 3.5 hours. Other options: do a combination of flight and taxi; or take a bus. Cap off your sightseeing on the 23rd (Thu) early enough to go by car to Pothamedu. On the 24th (Fri), examine the collection at Tea Museum, take in the exciting artwork at Mistletoe art Gallery, then take in the architecture and atmosphere at Mount Carmel Church &Mount Carmel Pilgrim Centre, then take in the architecture and atmosphere at C.S.I Christ Church, and finally take in nature's colorful creations at Tea Gardens. Here are some ideas for day two: get great views at Pothamedu Viewpoint, see human ingenuity at work at Mattupetty Dam, and then take in nature's colorful creations at Rose Gardens. To see other places to visit, ratings, more things to do, and other tourist information, you can read our Pothamedu trip itinerary planner. Getting from Thekkady to Pothamedu by car takes about 3.5 hours. Expect a daytime high around 39°C in May, and nighttime lows around 29°C. Finish your sightseeing early on the 25th (Sat) so you can travel back home.